Ruby Gill is a rogue MI6 agent, the daughter of an Indian father and Palestinian mother. Her mission is to destroy a Palestinian-Israeli peace summit in New Delhi. Ruby's father, whom she has not seen since age three, is now head of India's antiterrorist police. When the two first meet, Ravinder Gill believes his long-lost daughter has come for a reunion . . . but as time goes by, he begins to suspect that she is the terrorist he's searching for. 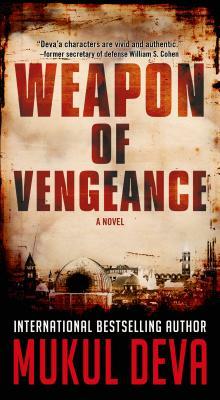 Combining a fascinating mix of terrorist operational detail contrasted with the coming together of a father and daughter who once loved each other but are now on opposite sides of a deadly encounter, Mukul Deva's Weapon of Vengeance is a gripping thriller filled with explosive action and weighty characters.